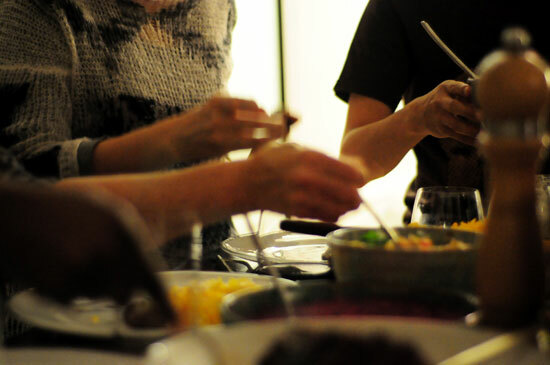 A Persian Dinner Party of Dreams … except that it was real! 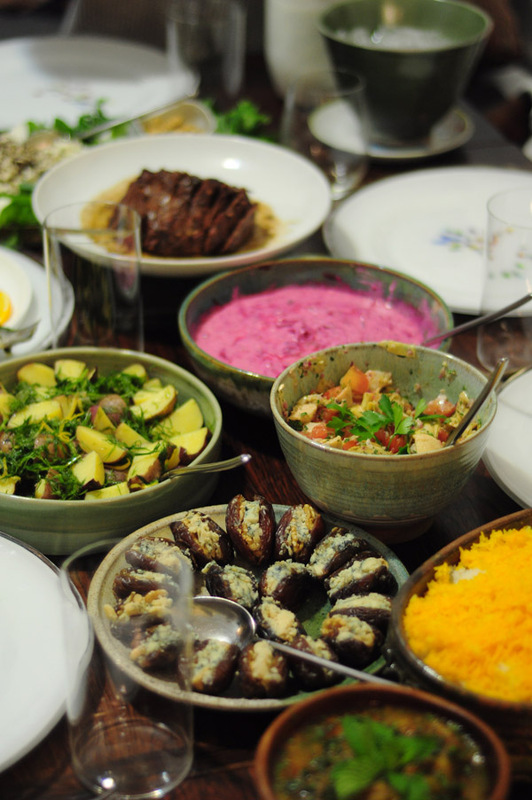 Shukri wrote the copy that follows – narrating the story of how the dinner party came to be and poetically detailing the dishes, several of which he made himself: rice; Medjool dates stuffed with walntus and Roguefort; and doogh, a most excellent and unique salted yogurt drink. Shukri was born in Kurdistan and has lived in Brooklyn for many years. When he’s not working, he either fiddles with bicycles or cameras, or he rides his bicycle, sometimes with a camera. If he’s forced to ride the subway because of endless winters, he likes to take his sketchbook on the train. Pericle took all the photographs featured in this post. Pericle is an architect and amateur photographer. Amateur is defined as a person who engages in an activity for pleasure rather than for financial benefit or professional reasons. The root of the word being the latin amātor (lover) equivalent to amā- (stem of amāre) which is: to love. Words are not required to explain that the love shines through the stunningly beautiful photographs. OK, then, now that we’ve met our hosts (so to speak) let’s proceed to get intoxicated in the heady delight of an ample amount of sensual gorgeousness! Fresh herb platter with feta cheese & walnuts. Served with bread. While waiting for my friend to dine and catch up at the wonderful Cafe Nadery in Greenwich Village, I happened upon a copy of The New Persian Kitchen by Louisa Shafia in their little library. Noticing they had two copies, I convinced the manager to sell me one. Upon arrival, my baker friend extraordinaire Bojana, immediately volunteered a Persian themed potluck dinner at her place. 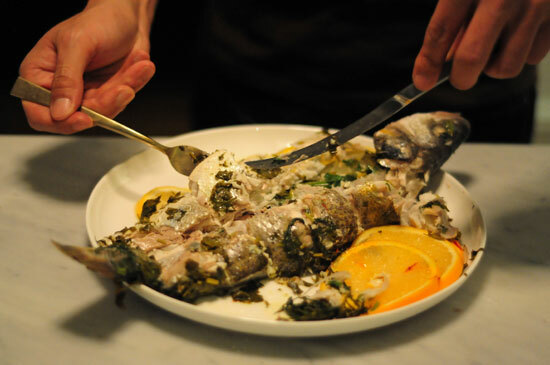 The date was set and guests were asked to contribute a dish inspired by the Persian cuisine. Having grown up in the Kurdistan region in northern Iraq, the ingredients in the book’s recepies were somewhat familiar to me. As the Persian Empire once stretched from Libya to India, Kurdish cuisine shares many of the same ingredients and dishes, although naturally varying from region to region. I made rice the Kurdish way, the way my mother taught me. Neither Kurdish nor Persian, Medjool dates stuffed with walnuts and Roquefort were a personal touch and therefore legitimate Hors d’oeuvre. Finally, I made the ubiquitous-in-the-Middle-East drink of salted yogurt, called Doogh in Farsi, Dao in Kurdish, and Ayran in Turkish. This too I made the way I knew. Although rigidly themed as you can tell, some guests proved unruly and insubordinate. 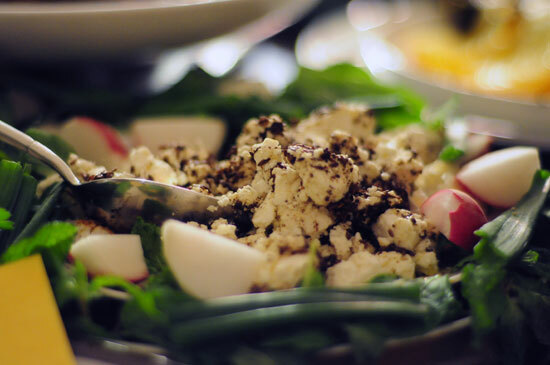 One guest had misheard the invitation and instead of Persian inspired dishes, he made two Syrian salads. Another guest baked a Dorada fish Mediterranean style.The venison, hunted by a personal friend, was entrusted to a guest who had never before tasted game. 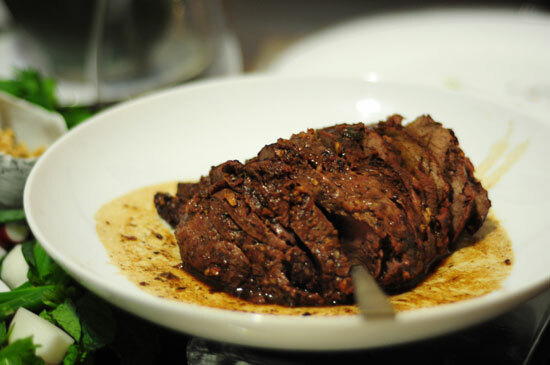 With a self described cookbook of intuition and feeling, the honorable deer was roasted to perfection. 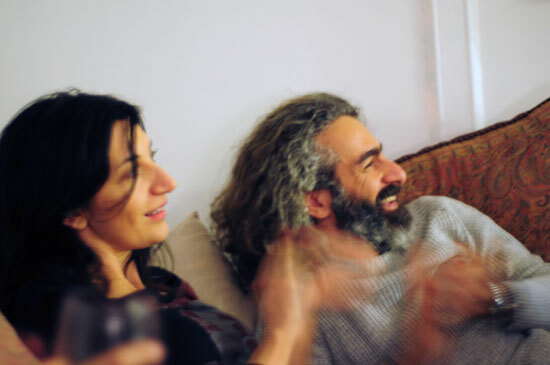 And while spirits are not (publicly) part of an Iranian meal, the assembled Diaspora enjoyed the homemade Romanian pear and apricot brandy procured by our friend Pericle, whose beautifully ethereal photographs communicate the atmosphere of our dinner. 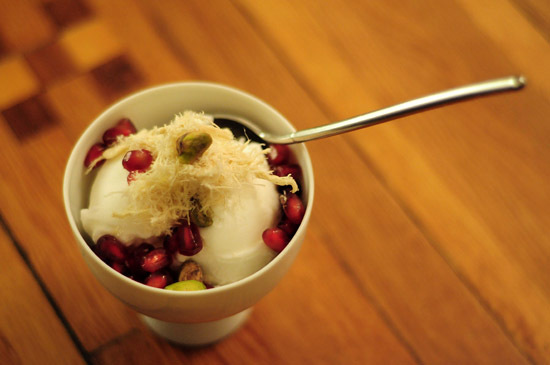 For desert, our gracious hostess and recently anointed architect of deliciousness, thought up a delicately layered Persian inspired Orange blossom frozen yogurt. The ensemble looked like a mountain, snowcapped with a sweet nest of halva, where two lovers (pistachios) are surrounded by a field of red roses (pomegranate seeds). Our photo shows one pistachio on the peak and one in the crevasse, but so it goes. Moans and groans were heard (for either pistachio) upon the tasting of the first spoonful. A truly amazing dessert, A worthy ending for the best of Persian feasts. 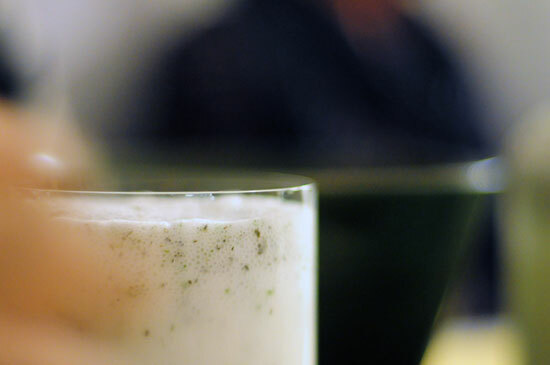 You can make frozen yogurt using your own home-made yogurt. I use Ronnybrook plain full fat yoghurt as a starter and whole milk. Follow any low sugar content frozen yogurt recipe, using an ice cream machine or; You can cheat; I found that plain tart flavor of Yogurtland yogurt is very close to the real thing. It will not be as full body tasting, as they are fat free, but it’s a great alternative. Bring yogurt to soft serve temperature. Add Orange blossom water and mix in by hand with a silicone spatula. To a 1/2 gallon of yogurt you only need to use a capful of the orange blossom water. Add more to taste, but carefully, the flavor can quickly overpower. Scoop nicely in a serving dish, sprinkle with pistachios, pomegranate arils and form peaks with your fingers atop of the yogurt with Shredded Halva. Ta-da! The desert is done. Serve with that sound and smile. Feasting is sometimes a somber business! Simply lovely! 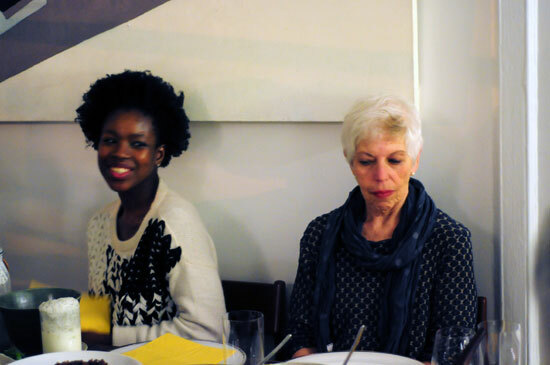 Thank you Shukri jan, Pericle jan and Bojana jan for a very special feast of a guest post! I too wish I had been at this wonderful dinner party. I also got excited by the third picture down. I used to own a chest like the one in the picture. It was bought on the Afghanistan border. The food looks delicious. I would eat it all. That IS a beautiful chest. What happened to yours? I had two, a big one and a small one. I had to sell them when I moved house 😦 regret it a little. 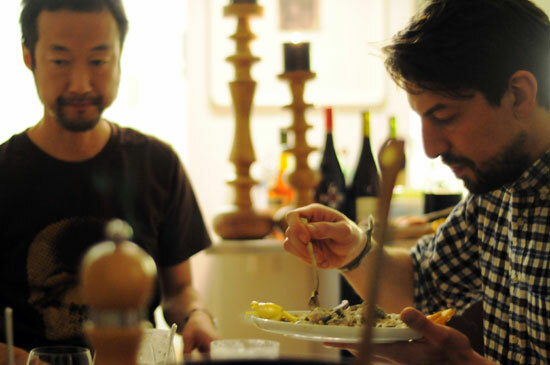 wow this is amazing, it is like looking through a gourmet magazine the photographs, the guests, the mood, the food, the story – I understand why you would happily donate one wish to to participate in the next dinner party! It really is rather sublime, isn’t it? I was so excited by the idea of sharing it! What a party! I love the pics and the description. Eating is serious business. Great photos and wow. I always greatly enjoy your posts, lovely Azita! I don’t have that book but I need to check it out as well. Thank you for visiting dear Celia! The entire spread looks incredible! I’m sold on the dessert and will certainly be making it. Thanks! What an absolutely wonderful idea… and so many beautiful recipes. I love the dessert especially! It does look quite ravishing doesn’t it? I do want a spoon! Such a gorgeous post, love, love, love! thank you, you are sweet, and it always makes me feel good and filled with good feelings to hear it. I know, Angie, right? But I also know that your dinner parties must be the stuff of dreams as well. I think not only you Azita, but all your readers have menu envy! I’ll just have to be happy with dessert, an absolute palate teaser! What a lovely party, everything looks and sounds delicious! 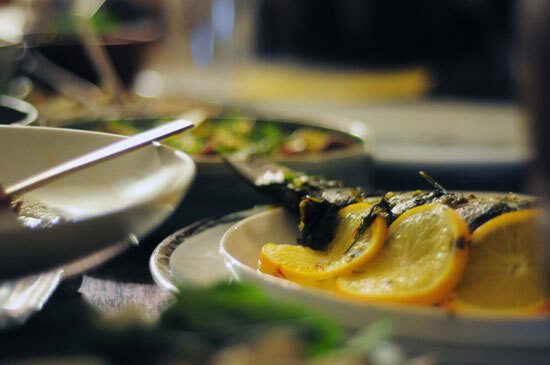 Everything looks absolutely divine – the food, the company, the warmth of the two combined. Ohh to have been invited to this dinner party! Gorgeous in every way… thank you for sharing this with us all! Beautiful and creative friends! Wonderful dinner! A dinner of dreams it is! Everything looks amazingly divine. I wish I was a fly on the wall (with a big belly to fill, of course!). Your dessert is a great addition. Beautiful! Thank you Melissa. The dessert was part of the dinner and made by Bojana! I did not make it but only admire it from afar although plan to make it as well soon. What an unbelievably delicious array of exotica. 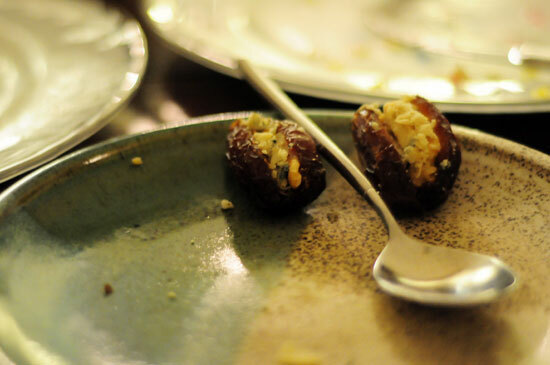 The medjool dates are a favourite of mine. When we stay at our son’s house in London, I make a point of making a daily visit to the Middle Eastern shop at the end of his road. It’s from this place that I stock up with things that I can’t find out in the countryside here in France. Ah. The tough life of the countryside in France. I kid. I kid! And probably because I know not its lack as there are quite a few stores nearby or relatively nearby that offer very decent selection of medjool dates. The food looks so delicious 🙂 I’d especially love to that that Dorado fish – it looks very similar to how my relatives in Italy prepare it. Glad to hear that you had an amazing dinner! That dish does look particularly handsome to me. Very appetizing. Beautiful meal and beautiful people! I would liked to have been there with you all, what a lovely feast for the eyes & mouth too! Yum Yum Yummm! Oh what a fabulous meal! My pleasure Fae! It was an irresistible impulse! Such a coincidence that, on the day that I read this, I’ve been perfecting my own frozen dessert, although mine is an ice cream made with Dutch spices. Oh, how interesting! Now that’s a good concidence. Do you have a post in your archives detailing the process of hand churning? I’d love to read it. I do. There is a handmade ice cream with photos if you are interested. I’ll be posting the Dutch spice ice cream soon, but I promised my brother in law that I would post a crumble recipe first! What a moutwatering feast! And that desert looks stunning! So glad to have stumbled across your blog!